Christopher Reeve continues to surprise the experts. Seven years after he was paralyzed from a spinal cord injury, tests at the Washington University of School of Medicine in St. Louis show the 50-year-old actor's brain maintains a near-normal ability to detect feeling and direct movement, a finding experts say is contrary to the "use it or lose it" rule about the brain. Years of research have shown in animals that when the spinal cord is severed, cutting off nerve impulses to parts of the brain, then the brain will reorganize itself and eventually not respond to signals from the paralyzed part of the body. That hasn't happened to Reeve. "We are very encouraged with these results," said Corbetta, the first author of a study in the Proceedings of the National Academy of Sciences. Other experts cautioned that the study deals with only one patient and that extensive studies would be needed to determine if the findings are true in other patients with spinal cord injuries. 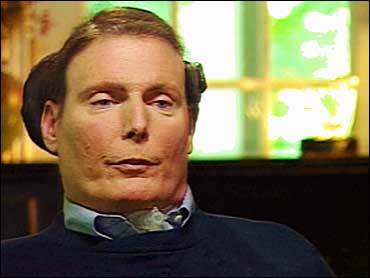 Reeve, who played Superman and other roles in movies, was left paralyzed from the shoulders down after breaking his neck in a fall from a horse in 1995. The fall severed most of the nerves in the spinal neural bundle that carries signals between his brain and the rest of his body. Pursuing his personal program for what he hopes will be recovery, Reeve in 1999 started a concentrated program of exercise and electrical muscle stimulation. Earlier this year, those efforts paid off as doctors announced the startling development that he has experienced a slow rebirth of limited sensation and movement. At the time, some doctors called it "an unprecedented amount of recovery" for a patient with such an injury. Corbetta said the new studies show Reeve may be exceptional in another way - his brain has remained receptive to signals from the paralyzed portion of the body even though most of those signals were interrupted by the injury. Some researchers, based on the animal studies, have suggested that repairing the spinal cord would do little good because the brain has effectively given up on the paralyzed portions of the body and has changed so it could no longer process those signals. "The usual argument is that the brain has reorganized so what good is it going to do (to repair the spinal cord)," said Corbetta. "At least in this case, some of the responses are more normal than we would have expected. So there is new hope." Naomi Kleitman, program director of spinal cord injury research at the National Institute of Neurological Disorders and Stroke, said the Reeve study is "an observation" that cannot be applied to spinal cord patients in general. But she said it does show the potential value of using MRI, or magnetic resonance imaging, to assess spinal injuries and to more precisely evaluate the prospects of recovery. The Reeve study should encourage more research in using the technique, she said. "This is an area the National Institutes of Health is very interested in," said Kleitman. MRI studies "hold tremendous promise" for determining the severity of spinal cord injuries and helping doctors direct rehabilitation. In the study, Corbetta said he and others at Washington University used an MRI to map the patterns of brain activity in response to touch and movement. For the movement study, Reeve followed the video image of a tennis ball and indicated the direction with either his tongue or the movement of the left index finger. As this occurred, the MRI detected the active parts of the brain. "There is a picture of your body plotted on the brain," said Corbetta, "with different parts of the brain driving different parts of the body." MRI, in effect, maps the areas that respond to specific actions or sensations. The researchers then compared Reeve's results with those of an identical test conducted on a healthy 23-year-old and found only slight differences. "We were surprised with the results," said Dr. John McDonald, a Washington University researcher and co-author of the study. "This crosses a new threshold." Corbetta said Reeve's brain was "pretty much normal on the sensory maps. He had feeling in both his foot and his hand." For motion, Corbetta said he found that areas of the brain that normally control the hand had been taken over, to some extent, by areas that control the face. The brain circuits linked to the foot, though, were normal. Reeve said in a telephone interview that he was excited by the results. "I find it very encouraging, not only for myself, but for other spinal cord injury patients as well," he said. "It means that there are no absolutes and patients should be encouraged to push as far as they can."